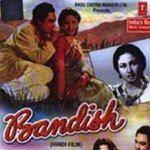 "Bandish" is a 1955 hindi film which has Ashok Kumar, Meena Kumari, Daisy Irani, Bhanu Bannerjee, Bipin Gupta, Nasir Hussain, Sajjan, Shammi and Mehmood in lead roles. We have one song lyrics and one video song of Bandish. Hemant Kumar has composed its music. Hemant Kumar has sung these songs while Prem Dhawan has penned its lyrics.